The opening credit sequence, in which we are given a history of Sabretooth and Wolverine via their involvement in every war from the Civil one through Vietnam. It's pretty cool, I have to admit. The music's right, the cinematography is awesome, hell yeah. 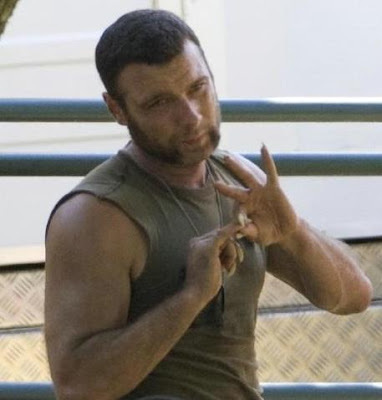 Liev Schreiber as Sabretooth/Victor Creed. Thank goodness someone can balance fun with awesome. I wish we could see more of him. The trailers that played before the movie were good, too. I'm super-excited for Transformers: Rise of the Fallen. Looks like a big pile of awesome. I love Michael Bay. He makes what he wants and never apologizes for it. And...yeah, that's about it. Not a good movie. Nope. Not even if you stretch your imagination a little. Oh, don't get me wrong, there's fun to be had -- some parts have just enough awesome stupidity to make you go, "Okay, what next?" Then the "next" comes, and it's thoroughly disappointing. C? C-? Somewhere along those lines. Shame on you, Hugh Jackman.